Ordinance No. Page 9 D. Permanent and Temporary Structures. 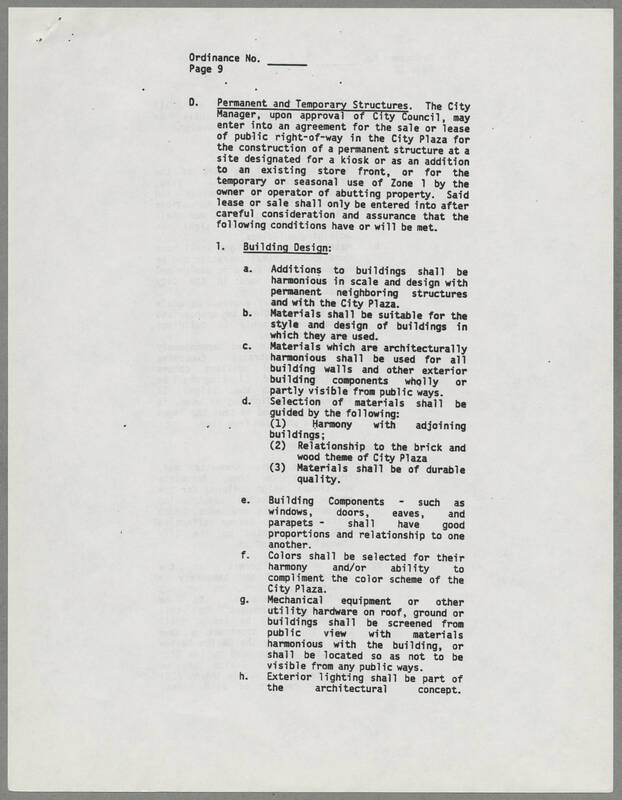 The City Manager, upon approval of City Council, may enter into an agreement for the sale or lease of public right-of-way in the City Plaza for the construction of a permanent structure at a site designated for a kiosk or as an addition to an existing store front, or for the temporary or seasonal use of Zone 1 by the owner or operator of abutting property. Said lease or sale shall only be entered into after careful consideration and assurance that the following conditions have or will be net. 1. Building Design a, Additions to buildings shall be harmonious in scale and design with permanent neighboring structures and with the City Plaza. b. Materials shall be suitable for the style and design of buildings in which they are used. c. Materials which are architecturally harmonious shall be used for all building walls and other exterior building components wholly or partly visible from public ways. d. Selection of materials shall be guided by the following: (1) Harmony with adjoining buildings; (2) Relationship to the brick and wood theme of City Plaza. (3) Materials shall be of durable quality. e. Building Components - such as windows, doors, eaves, and parapets - shall have good proportions and relationship to one another. f. Colors shall be selected for their harmony and/or ability to compliment the color scheme of the City Plaza. g. Mechanical equipment or other utility hardware on roof, ground or buildings shall be screened from public view with materials harmonious with the building, or shall be located so as not to be visible from any public ways. h. Exterior lighting shall be part of the architectural concept.